The whirr of fans, the taste of old air. Day after day cramped in perpetual, monotonous orbit with the same three colleagues, isolated hundreds of miles from family and friends. Life in space has glamorous, adventure-filled connotations, but the reality is a gruelling psychological challenge. In his 2006 book Space Physiology, former astronaut and medic Dr Jay Buckey (see box, ‘The astronaut’), reveals that psychosocial problems have been the leading medical cause of long-duration mission terminations. Little wonder then that NASA’s Bioinformatics Road Map (see tinyurl.com/3pp4wo), which is used to identify and assess the risks of crew exposure to the hazardous environments of space, codes psychosocial issues as ‘priority one’ for International Space Station and Mars missions. The psychology of space travel can be an awkward area for study. Astronauts are usually tight-lipped about any mental health problems they’ve encountered for fear of jeopardising their selection for future missions. Similarly, space agencies can be rather euphemistic when it comes to declaring the role psychological issues have played in mission terminations. Take the early return of the 1985 Salyut 7 mission. The official line from Russian officials was that appendicitis or prostatitis was the cause. Yet subsequent comments from the astronauts who were there have led many to conclude that the crew came home early because one member was depressed. 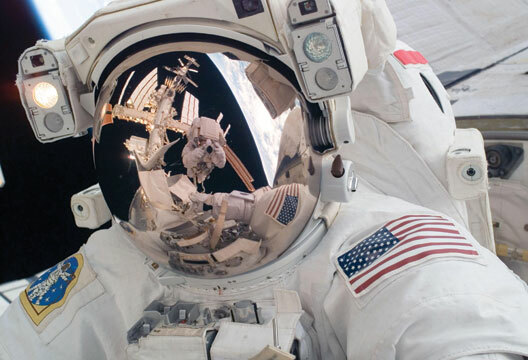 Despite these accessibility issues, psychologists play a vital role in space exploration: supporting crews, and researching and advising on astronaut selection and team composition. They also work on the development of so-called ‘countermeasures’ – procedures and processes put in place to help prevent psychosocial difficulties. Last year, the European Space Agency (ESA) launched its search for four new astronauts to join the European Astronaut Corps – the first such recruitment drive since 1992. NASA was also due to start a recruitment drive late in 2008, specifically seeking out personnel for long-duration missions to the International Space Station, the Moon, and even to Mars. History provides inspirational examples of the kind of characters who’d make ideal candidates for long-duration space missions. ‘There’s the Norwegian explorer Fridtjof Nansen,’ Buckey says. In the 1880s Nansen headed to the Arctic in a boat which became locked in ice. With only one colleague, Hjalmar Johansen, for company, Nansen continued on foot, ultimately spending nine months over winter in the Arctic. ‘He made it back to Norway and then went on to win the Nobel Prize for work in helping prevent starvation around the world – a truly remarkable guy,’ Buckey says. Rigorous selection procedures can ensure a roll-call of talented individuals but for a long-duration space mission, that isn’t enough. It is absolutely essential that the crew all get along as well as possible. This is no easy task. Like inert chemicals that become explosive on contact, human personalities can prove an unpredictable mix. In particular, issues of gender and culture can rear their heads, disrupting even the most carefully laid plans. Research by Nick Kanas and colleagues involving questionnaires completed by astronauts and cosmonauts aboard the Russian Mir space station showed the risks of having some individuals in the clear cultural minority. Crews on Mir missions conducted in the 1980s and 1990s typically involved two Russian crew and one American. On all four scales measuring satisfaction with their interpersonal and work environments, Kanas’ team found the American crew members scored lower than their Russian colleagues. Another problem that can arise is known as ‘displacement’ – the tendency for space crews to grow disillusioned with their colleagues on the ground. ‘Imagine you fall out with your boss,’ Kanas says. ‘You can’t really tell him off so you go home and you kick the cat or you yell at the next person you see because you’re displacing your anger and tension, not at the person you’re mad at, but to someone it’s safer to have a go at.’ In a similar way, astronauts living on top of each other in space often redirect their frustration towards personnel in ground control. A study by Kanas and colleagues involving 17 astronauts aboard the International Space Station appeared to provide evidence for the existence of displacement. The astronauts completed weekly measures of their mood, and the results showed that when tension in space was high, perceived support from ground control tended to drop. There was no evidence in the critical incident logs to suggest that ground control really were less supportive during these periods, so it’s unlikely that causality ran in the opposite direction. Data recorded during actual space missions is rare – it still remains the case that relatively few people have travelled towards the stars. And anyway, psychological data from missions is usually kept confidential. To overcome these restrictions, psychologists interested in issues of team cohesion in space have studied expeditions in so-called ‘analogue’ environments on Earth, such as the Antarctic, that share many of the challenges of space missions, in terms of isolation and confinement. A study Leon conducted in 1989 demonstrated how issues of culture and gender can get tangled together. Leon’s team studied psychosocial interactions during the 61-day Soviet–American Bering Bridge Expedition from Siberia to Alaska, which involved a mixed-gender, mixed-nationality 12-person team. ‘There were very clear differences among the males,’ Leon recalls. ‘The Soviet males tended to be very patronising to the women in the group whereas the Americans said: “Well, you know, you’re part of the group, this is fine, I don’t have to worry to carry your extra weight and so on. If you have a problem then speak up.” The Soviets, by contrast, felt they were being nice by offering to help with their load, but were perceived by the female team members as being patronising. The women’s attitude was “If I need help, I’ll ask”.’ Findings like these are highly pertinent to space travel, given that space missions, as epitomised by the ISS, tend to be increasingly international in nature. In the jargon of space travel, procedures designed to protect astronauts are known as countermeasures. For physical health, astronauts spend time exercising to prevent muscle wasting, and radiation exposure is monitored. From a psychological perspective, a central ingredient of the countermeasures involves bringing domestic comforts to the space station or shuttle. ‘Before they launch, we debrief them about psychological factors, what to expect, what people in the past have reported, and then we give them a buffet of services and support,’ says NASA psychologist Walt Sipes. Astronauts are provided with a tailor-made website from which they can access newspapers and read and reply to postings from family and friends. Similarly, the crews’ families are given plenty of assistance by NASA’s family support office, and they can dial up to a website of their own, to find out what’s going on with the mission. NASA also send up care packages to the crew, weighing up to 15 pounds – featuring, for example, drawings by the astronauts’ children, gifts, or a favourite T-shirt that they’ve requested. The crew also have films, an internet telephone, guitar and keyboard. There’s even a cupboard stocked with decorations for festivals like Christmas and Hanukkah. The crew also have weekly medical conferences with their flight surgeon and fortnightly private conferences with a psychologist. ‘We check with them on the normal things: sleeping, how they’re getting on with their crew members, with ground control, and we ask how their family is doing,’ says Sipes. In development for the future is a multimedia system, featuring videos, audio, animations and interactive questionnaires, known as the Virtual Space Station, which will provide astronauts with self-guided, computer-based psychosocial training and support during missions. The Virtual Space Station’s depression module will follow the problem-solving treatment (PST) approach to therapy. James Cartreine, the principal investigator on the Virtual Space Station project, says his team chose this form of intervention because it is empirically supported and has high face validity – in other words, it’s immediately apparent to users of the Virtual Space Station how the interactive programme is going to help them. Cartreine. ‘But none of the astronauts who have seen it so far have looked at it and thought that it’s this kind of squishy psychological stuff.’ Cartreine’s research team is currently planning a randomised controlled trial of the Virtual Space Station depression module. They’re recruiting from medical centres and medical firms and ensuring the participants are well educated, computer literate and of a similar age range. ‘We’re not just taking all-comers off the street, we’re trying to select people who in some ways resemble people in the Astronaut Corps,’ says Cartreine. As for the conflict management module, plans are afoot to test this on firefighters and paramedics. ‘The Virtual Space Station has become a research magnet for developing psychosocial support for astronauts, and it’s actually becoming a major component of NASA’s approach for maintaining crew health,’ Cartreine says. What about manned missions to Mars, slated by NASA and ESA to take place in the 2030s? Will this mean rewriting the rule book? What new psychological challenges would such a mission bring? First the logistics. Such a trip would likely take two to three years, including travel to and from the planet, as well as time spent there conducting research and exploration. The distances involved will also mean the crew will need to be fully autonomous: no more care packages, no chance to head home on the next available shuttle. Each crew member will be locked in for the full three years. Plans are already under way to simulate the effect of such a prolonged trip. Towards the end of 2008, ESA and the Russian Institute of Biomedical Problems were due to begin a 520-day mock Mars mission involving several volunteers working in isolated and confined conditions near Moscow. Sipes says NASA also has an ‘On Mars’ project, where among other things they’re practising delayed communication to find out what sorts of problems occur. However, one aspect of a Mars mission that won’t be possible to simulate is what Kanas has dubbed the Earth-out-of-view phenomenon. ‘No one in the history of humans has ever, ever perceived the Earth as an insignificant dot in space,’ he says. ‘The sense of everything that is dear to you being so distant – we don’t know what that means psychologically for people. It may mean nothing, it may mean an awful lot. But even if we accept that contact with extraterrestrial life is a real possibility, how on earth can we research the likely psychological impact? Harrison, who works with the SETI project on this issue, says there are a number of approaches. We can look at historical examples of explorers making contact with native cultures and also at the way ideas, such as maths and numbers, have been transmitted culturally. The latter case is particularly pertinent as it’s likely any contact we have with alien intelligence will be from afar. We may receive alien ideas even if we don’t get to meet any little green men. Another area that psychologists are involved in is so-called ‘human factors’: studying the ways that the space environment affects cognitive functioning, and the interaction between human psychology and equipment design. Meanwhile, Gloria Leon, professor emeritus at the University of Minnesota, is working on a NASA project related to the temperature regulation of the suits the astronauts wear when they explore outside the shuttle or space station. Temperature is maintained by a flow of water around the suits and can be controlled manually by the astronaut. Problems arise because the astronauts’ perception of their body temperature tends to go awry at the extremes. This is what happened to the cosmonaut Alexei Leonov, the first person to ever conduct a space walk. He overcompensated for the drop in temperature outside and had to be brought back into the spacecraft urgently. Dr Jay Buckey was a crew member with STS-90, Space Shuttle Columbia’s 16-day Neurolab mission in 1998 (see photo). The seven-member crew conducted life science experiments focusing on the effects of microgravity on the brain and nervous system. Q. A study that investigated the potential positive side-effects of space travel found only one reliable result – many astronauts said they were awestruck by the sight of the Earth, a reaction that in some cases prompted an enhanced interest in environmental causes. What is it like to see the earth from space? A. It gives a sense of our amazing potential – that we can put ourselves in a position where we can look down on the Earth like that; that’s an amazing capability. When you’re up there it just feels so natural, like ‘oh, of course, we were always meant to be up here’, but it’s really a remarkable achievement. Q. What was the most positive aspect of the mission for you? A. It is one of the most satisfying life experiences to be part of a really good functioning team, where the whole group is doing so much more than you could ever do by yourself, and where you’re contributing to that. The mix of skills makes it all happen and that’s very exciting. It’s what happened on our mission. For psychological research, what you’re trying to avoid is the psychology whereby the team, for whatever reason, diminishes each other – that for some reason their team effort is less than the sum of each individual’s potential contribution. Trying to make sure that for every mission you put together that right mix of people who complement each other – that is the art and the science of the psychology. Q. Is there a sense after travelling in space that nothing in life will ever top that experience? A. It’s a great experience, but then again every day is amazing – just the fact of being here and being alive, is a pretty cool thing. Certainly space flight is good because it’s so visible and so rare. That’s what makes it special, but the fundamentals of it; the things that we did to make that space flight possible are the same kind of things that really make a difference in so many other areas of life. Every day, we all have opportunities, both great and small, to do things that are going to make a difference. Buckey, J. (2006). Space physiology. New York: Oxford University Press. Carter, J.A. [Cartreine], Buckey, J.C., Greenhalgh, L. et al. (2005). An interactive media program for managing psychosocial problems for long-duration spaceflights. Aviation, Space, and Environmental Medicine, 76, B213–B222. Harrison, A. (1997). After contact. New York: Plenum Trade. Ihle, E.C., Ritsher, J.B. & Kanas, N. (2006). Positive psychological outcomes of spaceflight. Aviation, Space, and Environmental Medicine, 77, 93–101. Kanas, N. (2004). Group interactions during space missions. Aviation, Space, and Environmental Medicine, 75, C3–C5. Kanas, N. & Manzey, D. (2007). Space psychology and psychiatry (2nd edn). Berlin: Springer. Kanas, N.A., Salnitskiy, V.P., Boyd, J.E. et al. (2007). Crewmember and mission control personnel interactions during international space station missions. Aviation, Space, and Environmental Medicine, 78, 601–607. Koscheyev, V.S., Leon, G.R., Coca, A. & Treviño, R.C. (2006). Physiological design of a space suit cooling/warming garment and thermal control as keys to improve astronaut comfort, performance and safety. Habitation, 11, 15–25. Manzey, D. (2004). Human missions to Mars: New psychological challenges and research issues. Astra Astronautica, 55, 781–790. Sandal, G.M., Leon, G.R. & Palinkas, L. (2006). Human challenges in polar and space environments. Reviews in Environmental Science and Biotechnology, 5, 281–296.